Well "Hello" everyone! Sorry I have been MIA for the last couple of weeks, but from what I see out there in blog land I am not alone. Can I just say it is plain hard﻿ to find the time to blog during the summer. The kids take up the majority of my time and if I dare start on a project it usually gets interrupted, but I am OK with it. I am OK because I know the precious time with my girls is going to be gone before I know it. I will have ALL the time to blog later, right? Can I get an AMEN?? Life is passing us by so quickly and I don't want to miss any of it......but for the meantime, I wanted to share a little fun trip that we took as a family a couple of weeks ago. 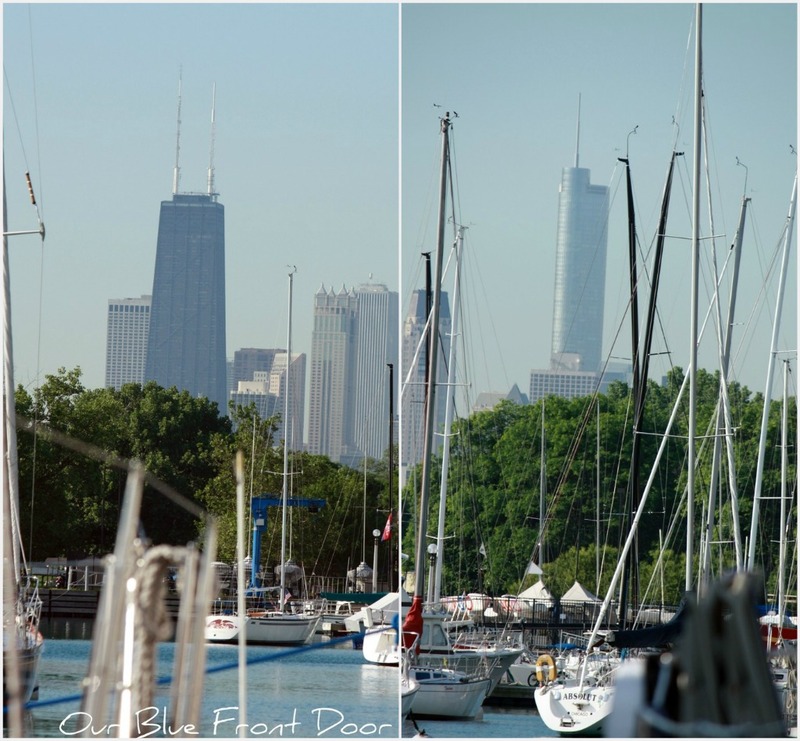 We are about 2 1/2 hours south of this little city named Chicago :) My hubby's boss usually invites us up once a year to his boat up on Lake Michigan. Do you know where I am going with this?? I bet so! 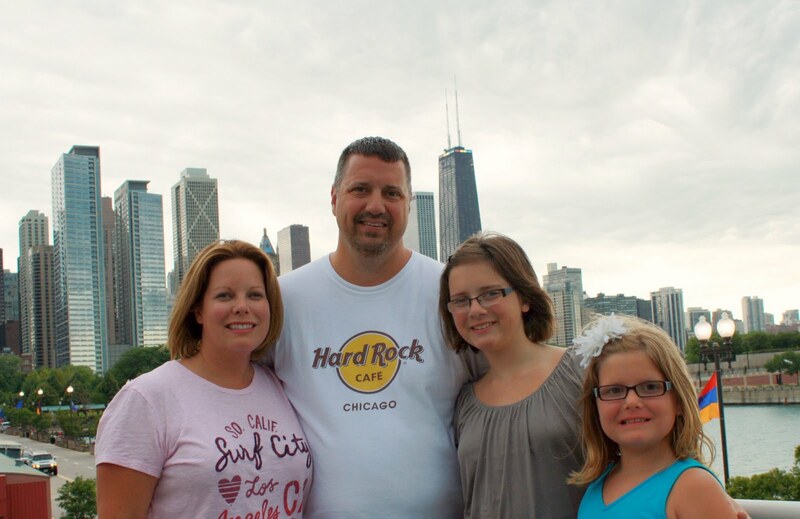 We were in Chicago for Spring Break, but this time it was a completely different experience. Yeap, this is where we stayed with my husband's boss. There was plenty of room inside with a master suite and spare bedroom each with their own head(boating lingo, really) or bathroom. 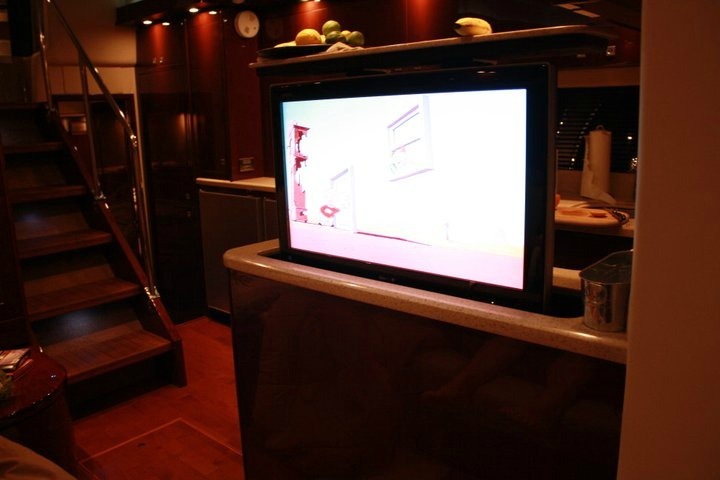 It had a full kitchen and the girls loved, loved the huge flat screen TV that came up out of the island. The girls made it pretty clear that the boat had more TV's than we have in our house.......trying to be humble I just said "I know"
Notice the fruit bowl on top of the TV?﻿ When the TV is down it's the top of an island. Here's the view in the morning right outside of the boat. What a beautiful view! On the left you see the John Hancock building and on the right is the newest high rise in Chicago, Trump Tower. 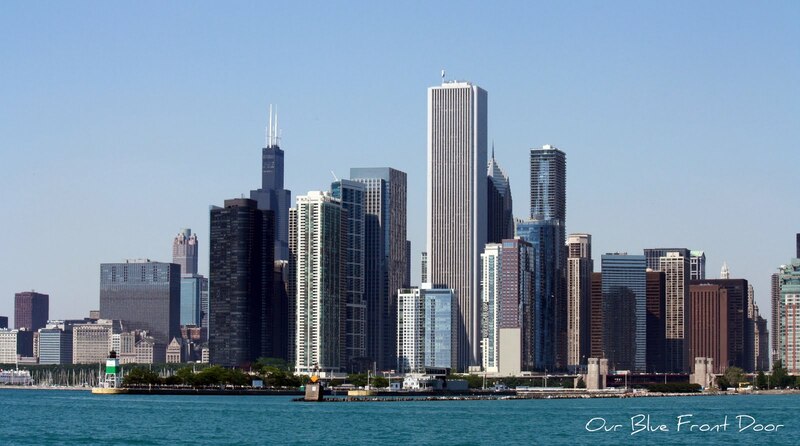 I just love architecture and Chicago is the perfect city for it. 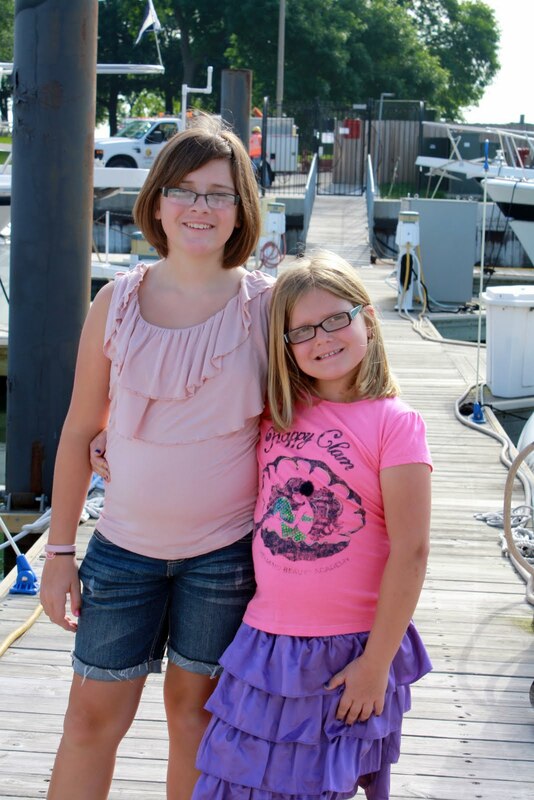 The girls on the dock pausing for mom to take another picture. 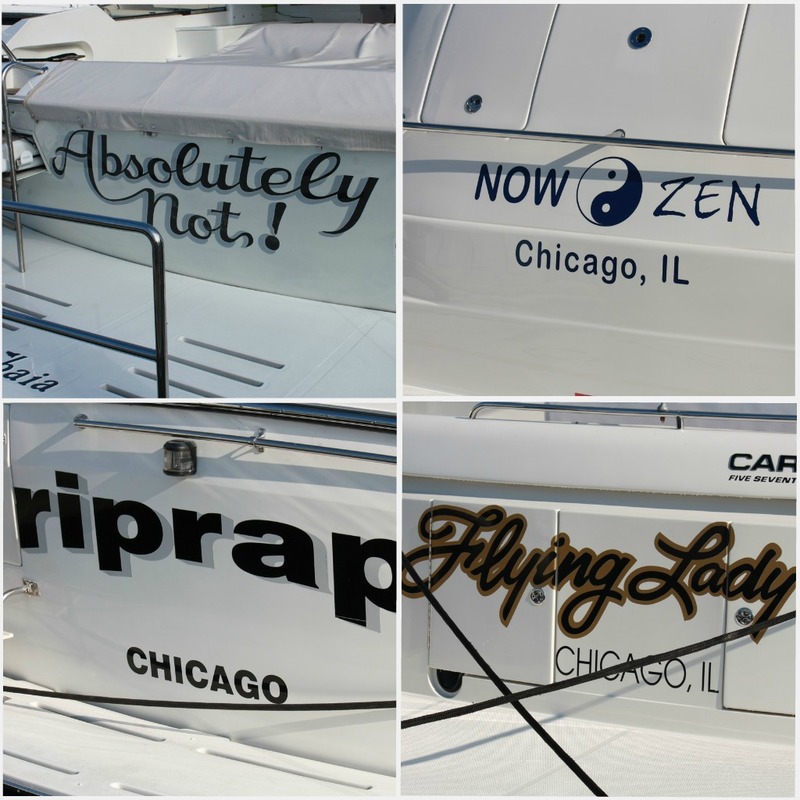 While I was taking a million pictures I got a couple names on some of the boats in the marina. 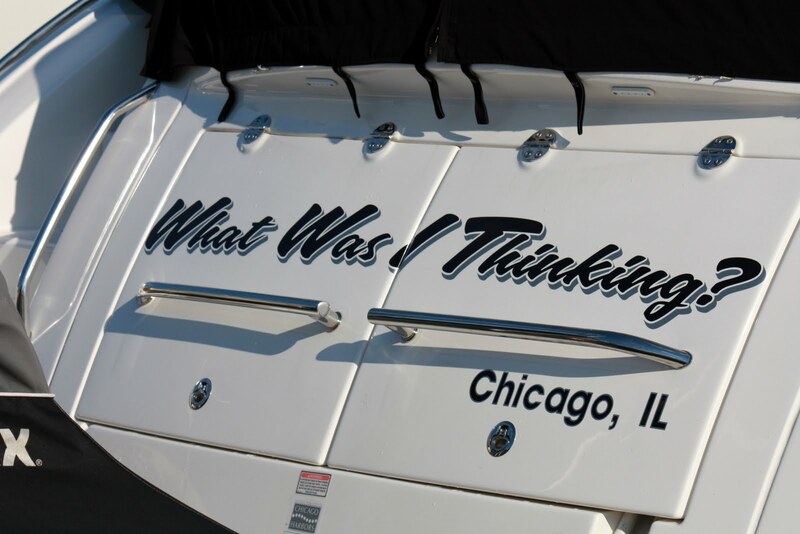 Hum....if I had one of these what would I name my boat?? I don't have to worry about that anytime soon that's for sure. This is not a post card! It looks like one, no I took this while we were cruising down the lake. The lake was beautiful today and the weather couldn't have been better. 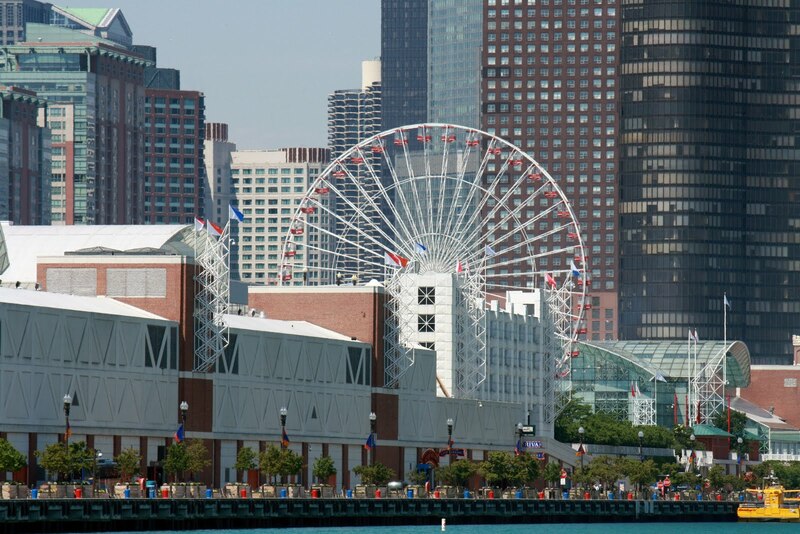 To the right of Navy Pier on the lake is a spot on the water called the Play Pen. It's an area right along Lake Shore Drive and is surrounded by a breaking wall to control the waves coming in. It's the perfect location to dock your boat and just chill. His boss also has a jet ski on the back of the boat so we all had a blast jet skiing in the Play Pen. If your not familiar with Lake Michigan, the water temps are always cold. On that day the water was about 68 degrees, too cold for this mama! We didn't do a lot of swimming, but our youngest jumped in and quickly got back onto the boat. Have you been to Chicago? Would love to hear all about it! Hi Andrea! I love Chicago too! It's such a fun city to visit! The view from the boat is gorgeous! Sounds like you had a blast! Enjoy the rest of your summer.